If simple living means living happier, you’ll find bliss in the 186-square-foot POD-Idladla, a compact prefab home for two that can move almost anywhere you wish. 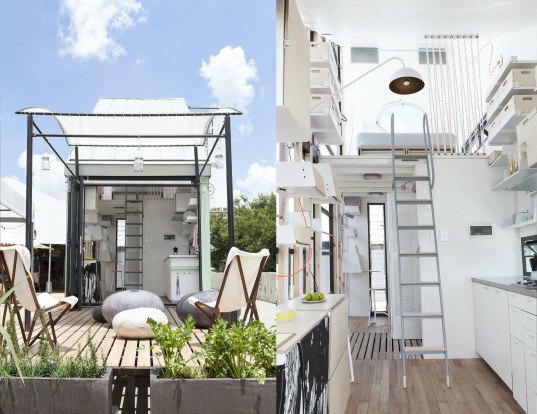 South Africa-based architect Clara da Cruz Almeida collaborated with local design firm Dokter+Misses to create the modular nano-home, which is powered by solar energy and can be customized off-site to the client’s specifications. The minimal and charming mobile pod ships flat-pack and assembles onsite in a snap. If the POD-Idlala looks familiar, it’s likely you’ve seen images of its predecessor, the Indawo/lifePOD, also designed by Almeida and Dokter+Misses. While the rebranded POD-Idlala sports a similar clean and minimal aesthetic to the previous prototype, this new design diverges in two main ways: first, opaque metal siding has replaced the clear plexiglass walls seen in the Indawo, and two, there is greater emphasis placed on the POD-Idlala’s modular design. Each mobile pod accommodates two people (with space for the occasional visitor) but can be expanded with additional pods to make multi-unit configurations to house up to 12 people. 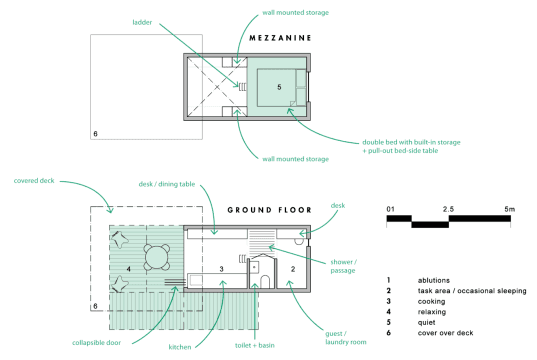 The design goal behind POD-Idlala was to make an attractive eco-friendly home that promoted simpler living and was affordable enough to appeal to young adults. “I realized the answer [to homeownership for young professionals] was to build literally the smallest space possible, but one that was designed for the local market and using locally sourced materials in keeping with the desire to limit the footprint,” Almeida told mblife. The energy-efficient POD-Idlala is topped with a pitched roof that maximizes solar potential with room for solar panels. The white and mint green-painted facade reflects the harsh sun to keep the interior cool, while the multiple openings and operable concertina doors promote natural ventilation. The POD-Idlala can be further customized for off-grid capabilities. The interior, mostly painted white and punctuated by pops of color and wooden surfaces, features tall ceilings and includes an upper loft level accessible via ladder. The kitchen, office, bathroom, and dining/living area are located on the first floor, while the bed is placed in the loft. Storage compartments line the walls and folding furniture maximizes the use of space. The POD-Idlala is currently on show at the Nirox Foundation Sculpture Park and will soon be available for sale in South Africa. Price estimates put the tiny mobile home between R200,000 to R700,000 (USD$15,765 – $55,175) depending on the amount of customization. This is a unique design but what happens in inclement weather when everything runs down that roof at the base of the entry? The white and mint green-painted facade reflects the harsh sun to keep the interior cool, while the multiple openings and operable concertina doors promote natural ventilation. The energy-efficient POD-Idlala is topped with a pitched roof that maximizes solar potential with room for solar panels. Storage compartments line the walls and folding furniture maximizes the use of space. 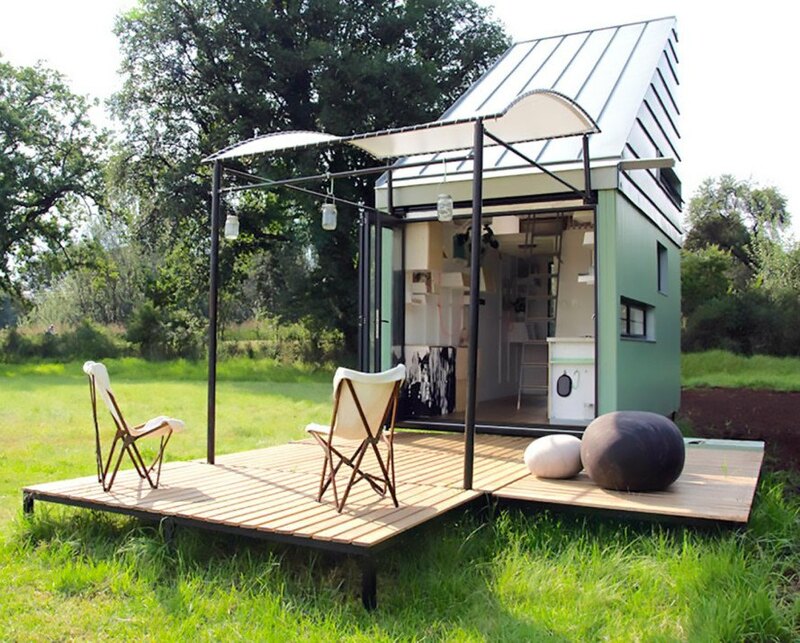 The POD-Idlala can be further customized for off-grid capabilities. The interior, mostly painted white and punctuated by pops of color and wooden surfaces, features tall ceilings and includes an upper loft level accessible via ladder. The kitchen, office, bathroom, and dining/living area are located on the first floor, while the bed is placed in the loft. Floor plan of a basic pod. Two pods placed together can accommodate four people. Here, two pods face one another to create an inner courtyard. This configuration accommodates six people. Combination of four pods can accommodate 12 people in a six bedroom home.